​Located just southwest of Madsen Red Lake Gold Mines, the Starratt-Olsen Gold Mines claims were first staked in 1926. The original claims lapsed and were re-staked by David Olsen in 1934 and by Robert Starratt and William Cook in 1935. Hollinger Consolidated Gold Mines optioned the Olsen claims in 1934, and Val D’Or Minerals optioned the Starratt claims in 1935. Val D’Or completed trenching, sinking a 27.7-metre shaft (90.8 feet) and over 3,500 metres (11,483 feet) of drilling on the Starratt claims before Faulkenham Lake Gold Mines optioned the property in 1938. From 1938-1939 Faulkenham Lake Gold Mines deepened the shaft and completed hundreds of metres of surface and underground drilling. Exploration efforts continued after Hasasga Gold Mines acquired the claims in 1939. Between 1939 and 1944, Hasaga Gold Mines extended the shaft to 91.7 metres (300.8 feet) and performed both surface and underground drilling. Starratt-Olsen Gold Mines was incorporated in 1945 to take over the claims from Hasaga Gold Mines. Hasaga Gold Mines maintained a 50% interest in the property. With the mill from Uchi Gold Mines, Starratt-Olsen Gold Mines went into production in September 1948. The mine produced for eight years and produced 163,990 ounces of gold between September 1948 and September 1956. When the mine closed, the company sold what they could – the mill, for example, was sold to H.G. Young Mines. While Starratt-Olsen Gold Mines ceased production, that is not where the mine’s history ends. The mine’s name lives on in the community that developed around the mine. 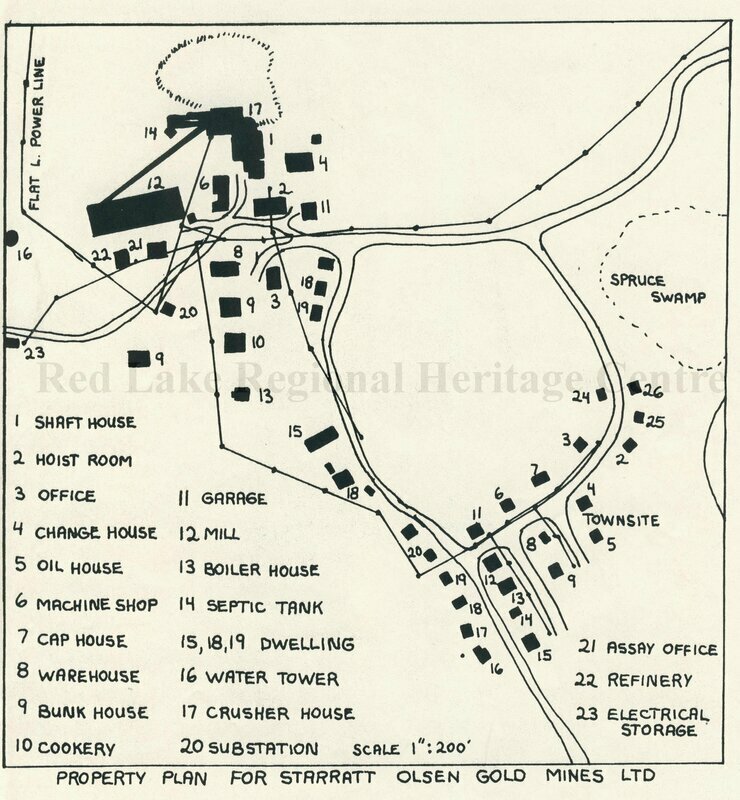 Like many of the mines in the Red Lake district, Starratt-Olsen Gold Mines established a small town near the mine site for employees and their families. Over the last 60 years, the town’s population has waned, but Starratt-Olsen remains one of the six main communities that make up the Municipality of Red Lake. The mine site itself saw little activity during the last half of the 20th century. In 1957, Starratt-Olsen Gold Mines changed its name to Starratt Nickel Mines and was later bought by Dickenson Mines in 1965. While limited, both companies did some exploration on the site after Starratt Nickel Mines acquired the nearby New Faulkenham Mines property. The Starratt-Olsen Gold Mines property was combined with that of Madsen Red Lake Gold Mines in the 1980’s when E.R. Rowland purchased both former mines. The combined properties were renamed Madsen Gold Corp in 1991 after Buffalo Red Lake Resources acquired the properties from E.R. Rowland’s estate. Today, the Starratt-Olsen Gold Mines property is part of Pure Gold Mining’s Madsen Gold Project.